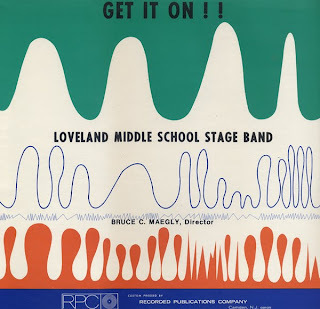 Direct from sealed shrink wrap, it's The Loveland (Ohio... I think. I bought this LP in Cincinnati) Middle School Stage Band! This is an interesting compilation LP produced by Columbia Records by request. 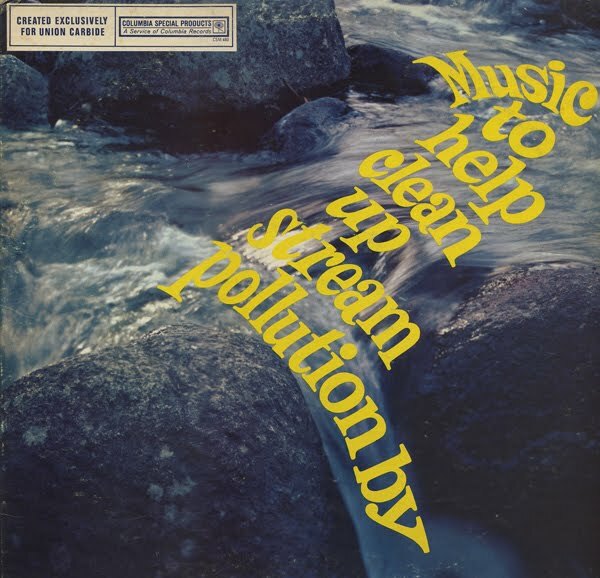 All of the tracks have something to do with water, including My Dirty Stream, by Pete Seeger and Stranger On The Shore by Anita Bryant. At quick glance I assumed that this record project was a way for Union Carbide to paint a happy face on some bad publicity they may have received when waterway pollution was grabbing the headlines. But, no... this record is some sort of promotion for a chemical "Tergitol S (surfactants). Apparently this chemical is biodegradable while other surfactants of the time were not. The surfactant was used in the production of paper, leather, textile and detergent products. The jacket notes indicate that "...the problem is ugly foam in our water resources." And Tergitol S will cure that. All said... I still do not yet know how these exclusive specialty albums were distributed. Who would buy, at a record store, an album like this? 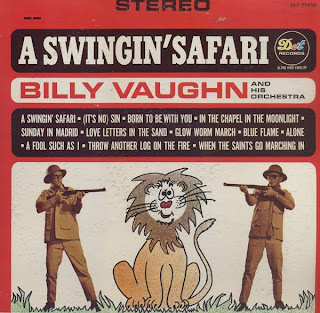 This record must have been seen at the time as an advertisement. Additionally, the title is so weird and the songs so divergent that I can see little appeal even as a give-away. I found the original LP with lyrics booklet today. This collection can be found remaster on CD or by the song on Amazon. 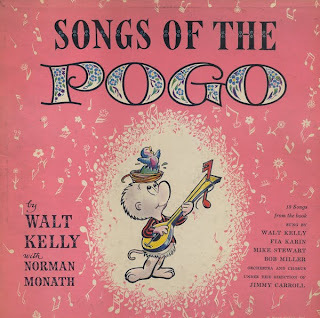 What intrigued me was that not only did Walt Kelly, the cartoonist, write the lyrics but he also sings a few tunes. He has a rather booming fun voice. One of my favorite tracks is Don't Sugar Me, Sung By Fia Karin (she does a few tracks and they are all very nice). More information on the illustrious career of Walt Kelly can be found on Wikipedia. 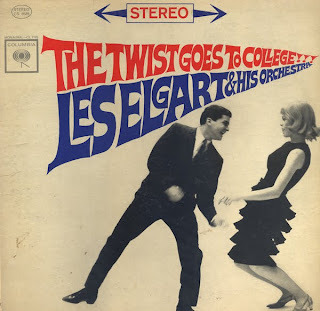 Great and silly cover on the outside with yummy sugar filled early 60s AM easy listening music on the inside. Above is the stereo album cover. In this case... the model's head is right side up, rather then "up side down" as it appears on the Mono release. 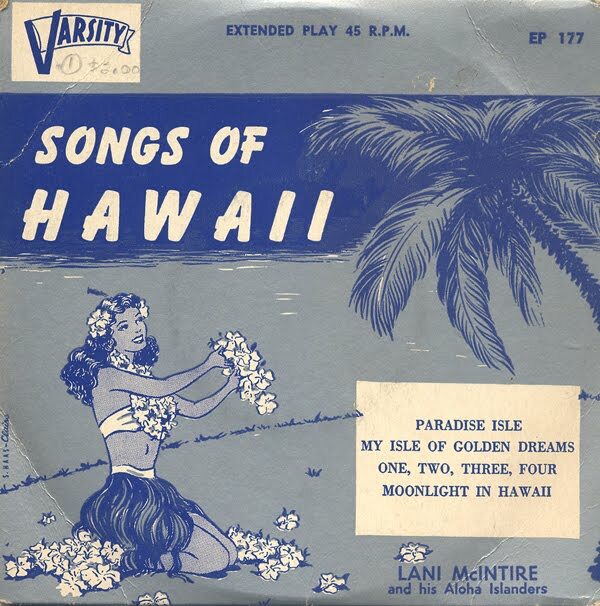 Lani McIntire (1904 - 1951) worked with Jimmie Rodgers to pioneer a sound from the Hawaiian guitar that laid the foundation for the steel as a standard country music instrument. Great space age cover. Easy listening big band tunes with a twist. 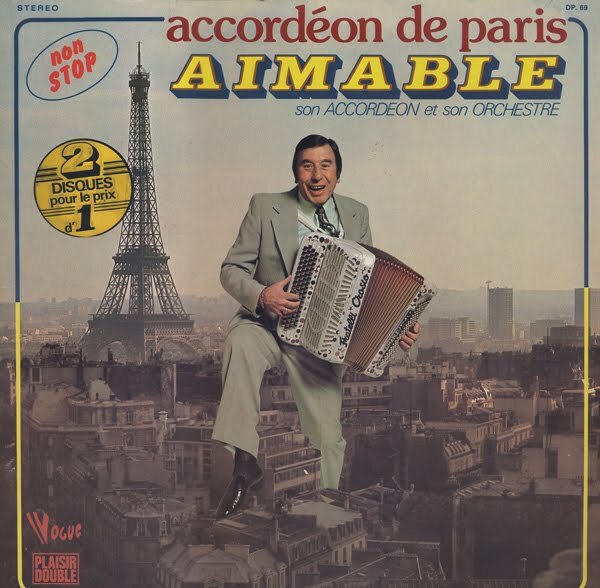 I couldn't resist the cover image featuring our artist posed over Paris moments before he unleashes an atomic death ray from his radioactive accordion! OK... that's a stretch. Maybe he'll just destroy Pairs the old fashion way... knocking down one building at a time while he wrestles Godzilla. 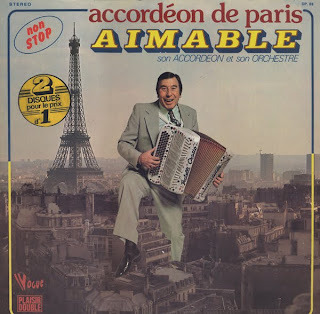 The accordeon music is simply non STOP on these TWO disques. And, frankly, the music isn't all that bad. 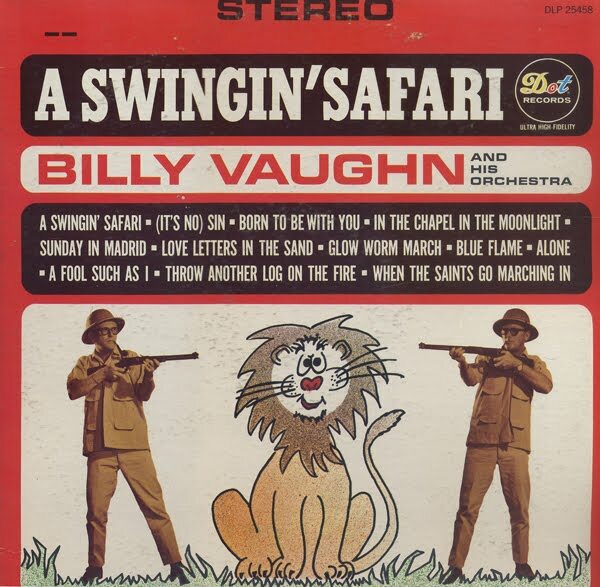 A number of tracks are early 70s easy listening throw backs that are cheesy good fun. Terrific space age cover that I'm having trouble dating. My guess would be late 50s early 60s. 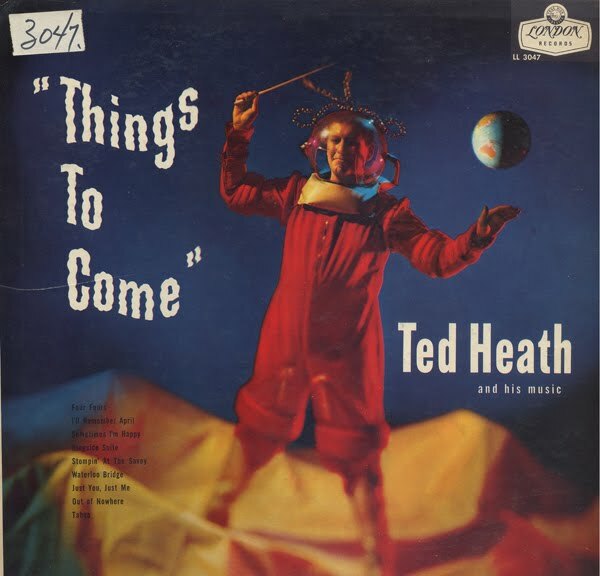 Big band jazz, light on the space age. 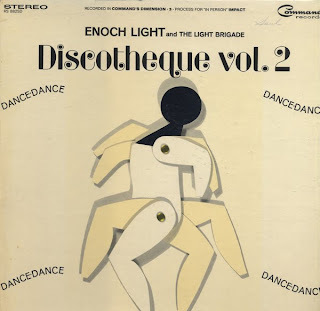 Light does it again with Volume 2 of the Discotheque series as he manages to pack this record with totally hip & campy 60s tunes.